Bengaluru has its own famous street foods. You will find them in popular streets. You can choose from traditional Indian food to contemporary to western street food. Dosa has become one of the top street foods in India, and not just in Bengaluru. It is a traditional dish from south India, and you will find people making them at home too. 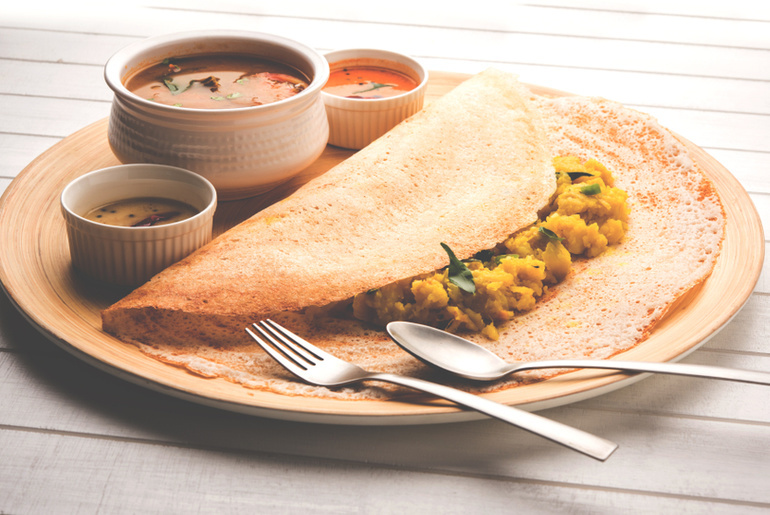 One of the best things about the Dosa is that it’s available in a wide range of styles. You can go for simple dosa with chutney and sambar, or for ghee dosa, or masala dosa and the list goes on. It’s best eaten hot and crispy. It delicious and easy to eat and its very filling without making you feel too heavy. When you are living in Bengaluru and have a busy life, and don’t have enough time to cook, Dosa can become your go-to food for breakfast and dinner. You will find the dosa stall all over the city, so don’t have to make extra effort to locate them. Mangalore Buns are one of the favourite street foods in Bengaluru known for its sweet taste and fluffiness. It is made from flour and banana and is usually taken as breakfast or as a tea time snack. It is usually served with coconut chutney and sambar. It is a popular dish found in the household of Karnataka. But, people who come from different parts of India love this sweet and fluffy puri like the dish as it is not only delicious, it is also very filling. Take it with tea or coffee in the evening and your mood is sure to get better. Idli is also very popular all over all of India. It is the go-to breakfast for many. In Bengaluru, idli is one of the famous street foods people love. It is easy to make, is delicious, healthy and very filling. It is made from rice mixture and is steamed or fermented to make it’s fluffy and soft. For people who are looking for a quick breakfast, ildi is the best morning and evening snack in Bengaluru. It is usually served with chutney and sambar. Idli is very popular and can be cooked at home. It is a very popular south Indian dish. If you want something quick, delicious and light then go for Idli. Medu vada is another famous street food and snack in Bengaluru. It does look like a doughnut but is not sweet like it. It is prepared using dal and then it’s deep fried in cooking oil to make a crispy and delicious Medu vada. It is usually served with a sambar or chutney. It is a very popular street food known for its deliciousness. It is also very filling, so in case you don’t have time for breakfast at home, try the medu vada. It is made from the black lentils or urad dal mixture. Additionally, asafoetida, methi seeds (fenugreek), ginger, cumin seeds, black pepper, curry leaves, and chillies are added to it. It is one of the most common street foods you will see across India. It is also one of the popular street foods in Bengaluru. It is a very healthy, delicious and filling food from the South Indian Cuisine. It is made from rice flour and onions and is usually eaten with coconut chutney. It looks like dosa but, it is a bit thicker and softer. It tastes best when eaten plain. In addition to this, you can order this food online using Zomato Offer Code.